But Do They Make Omelets? Short answer: Nope. Fire ants like their lizard eggs raw. Our recently accepted paper in the Journal of Herpetology “Invasive Fire Ant (Solenopsis invicta) Predation of Eastern Fence Lizard (Sceloporus undulatus) eggs” shows that fire ants do indeed eat fence lizard eggs in a natural setting, but, despite being known as “fire” ants, these hymenopterans haven’t quite mastered the art of cooking their food prior to chowing down. Get your non-final, still with a couple of mistakes, pre-print copy online (paywalled) or download one from this blog (posted for personal use of our readers courtesy of SSAR)! At this point, you may be asking yourself, “Why should I care if fire ants eat fence lizard eggs?”, so I’ll discuss the impetus behind this project. Previous research in the lab had given us a good idea of how fire ants can impact juvenile and adult fence lizards: they are found frequently on the ground by fire ants, stung if they don’t run away, and can be envenomated when eating fire ants. BUT we knew incredibly little about what impacts fire ants might have on one unexplored life stage of fence lizards: eggs! And unlike juveniles and adults, these eggs can’t flee or twitch when attacked by fire ants; they remain in a nest for 55-70 days (depending on site and temperature), during which time they might be vulnerable to fire ants. Additionally, fence lizards often (though not always) prefer sandy sites with low canopy cover, where sunlight can warm the nest, exactly the type of microhabitat beloved by fire ants. And fence lizards build their nests 4-8 cm underground, right at the same depths where fire ants construct their underground foraging tunnels. We surmised that fire ants might come into contact with fence lizard eggs with some frequency, and, if fire ants ate the eggs, this might have a large impact on fence lizard populations. Fire ants are known to eat the eggs of other reptiles, including those of snakes, turtles, and some lizards (such as anoles). To determine if fire ants were physically capable of eating fence lizard eggs, Jill Newman (a former lab undergrad who just started her master’s at Clemson…wooooooo! ), Tracy, and I designed a small experiment. We presented fence lizard eggs to captive fire ant colonies and observed them penetrate the eggs in less than 30 minutes…a rather dramatic response! However, we also wanted to see whether fire ants might eat fence lizard eggs under more natural conditions. To address this, Jill dug holes in the ground to the depth of fence lizard nests and placed 12 eggs near fire ant mounds overnight. Upon examination, 11 of the 12 eggs had been punctured and eaten in less than a day! The next summer, I designed a follow-up experiment to learn more about this type of predation. Specifically, I wanted to know how many eggs fire ants might eat, how quickly they might find them, and whether any environmental variables, like distance of a fence lizard nest from a fire ant mound, might affect predation. To address this, I started by collecting fence lizard eggs. A LOT of fence lizard eggs (over 150!…I resisted the urge to make my own omelet). I couldn’t, however, just bury the eggs in the ground and check them after 24 hours (as Jill did) to answer my question about how long eggs might survive…I had to be (a little) creative. After reading about a similar problem faced by Kurt Buhlmann and his solution when he wanted to monitor turtle eggs, I developed a method allowing me to monitor the eggs daily without disturbing them (which might attract fire ants and increase predation). For each nest, I dug a hole into the ground and sunk into it a clear, capped acrylic tube. I carefully replaced the sandy soil around each tube and placed six eggs (a small, but reasonable size for a fence lizard nest) next to the tube. I inserted a small piece of plastic transparency above the eggs and then carefully covered the whole arrangement with the soil. The transparency prevented soil from entering between the eggs and the acrylic tube, and, by lowering a video camera into the tube, I could count the eggs and see if they were being attacked by ants (or other predators). At each “nest” I also measured the amount of canopy cover and the distance to the nearest fire ant mound. 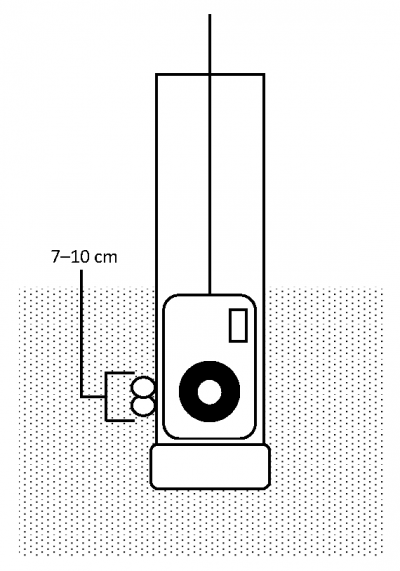 Diagram of nest tube with camera for viewing eggs underground. …aaaaand what one of them looks like in the ground. Each day, for up to 20 days, I monitored the nests and recorded if all the eggs were present. If I found ants attacking the eggs, I waited a few hours to let them eat the eggs (or at least let them make a start) and then dug up the nest to catch and identify some of the ants. I can definitively say that fire ants do not like to be disturbed when they are in the middle of a meal! Because of our innovative setup, it only took about 3 minutes a day to monitor each nest (check out a couple of examples below). 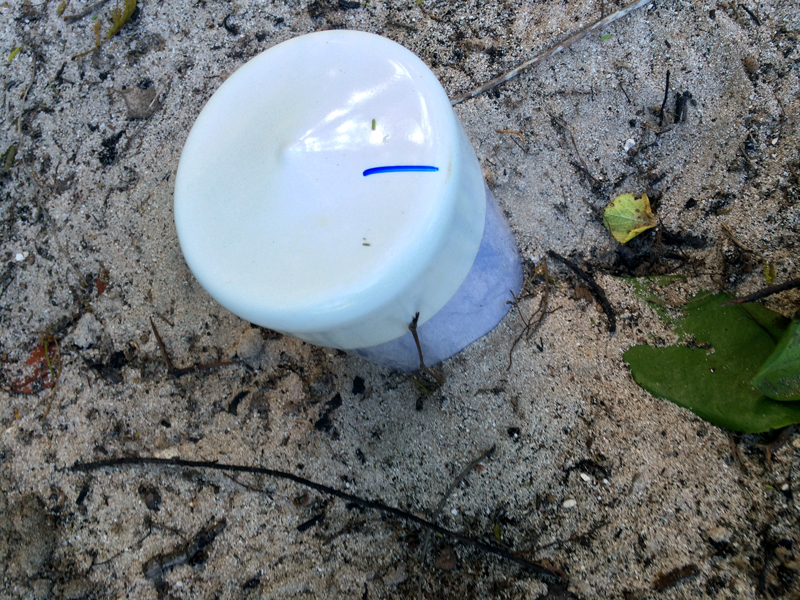 In our trials, we found that 24% of nests were attacked by fire ants within 20 days. Extrapolating this to the full incubation period of fence lizards using a mathematical model, we estimated that up to 61% of fence lizard nests are in danger of being preyed on by fire ants. We also did not find any relationship between how far nests were from fire ant mounds and how likely they were to be eaten. Given the high densities of fire ants at many areas in the Southeast, it seems likely that fire ants prey on a substantial portion of fence lizard nests in the wild. Of course, we know that fence lizard populations where we do our research are not in danger of disappearing. Fence lizards are doing fine even in the face of this predation, which is great news, and suggests that survival in other parts of a fence lizard’s life or high reproductive output may allow them to persist in fire ant invaded areas. In the future, I am aiming to build mathematical population models to understand the impacts of egg predation by fire ants, and see how this predation may affect populations over the long term. One other point of note is that, for many species of southeastern herps that are declining, such as kingsnakes or southern hognose snakes, fire ants are often suggested as a culprit without any definitive proof. My project suggests that fire ants can indeed prey on large portions of the nests of some species, but also shows that one species is doing just fine even when fire ants may be making a buffet of about half of its nests. Moving forward, I would recommend that lab and field trials like those we’ve done be used to pinpoint if fire ants are indeed a threat to the eggs of these other species, and, if so, what proportion of nests are at risk. Categories: Articles and Presentations | Tags: Eastern fence lizard, egg, fence lizard, Fire ant, nest, Predation | Permalink.